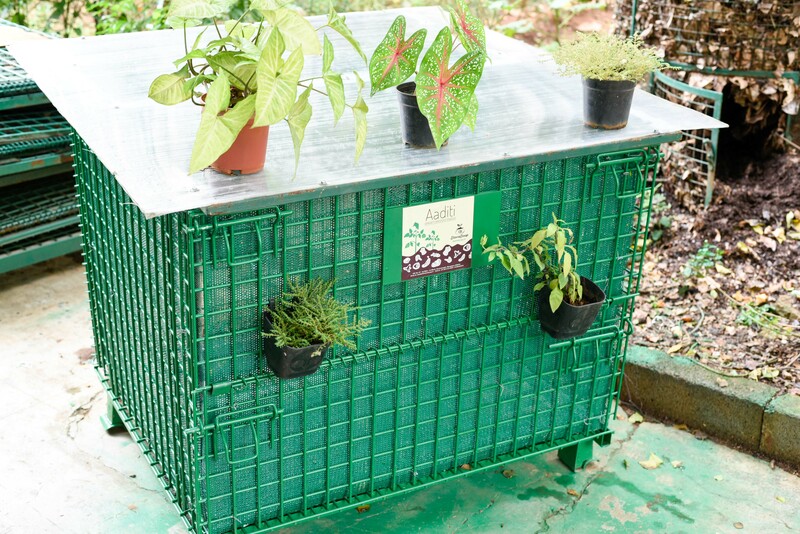 This observation goes well with Aaditi—a scalable aerobic composting system—designed, manufactured and marketed by Bengaluru-based startup company Stonesoup. It’s an entrepreneurial venture by SWM activists Malini Parmar and Smita Kulkarni. During my discussions with the Stonesoup team, one thing became clear. There’s been some sort of environmental feminism at play here. Led by these two committed activists-turned-entrepreneurs, the team consists of 90% women employees. It goes further. Even while designing Aaditi, the thought process was evidently gynocentric. Aaditi is designed in such a way that it doesn’t necessarily need male employees to lift, assemble, handle or disassemble it to harvest compost. It is a light-weighted, easily collapsible and shippable unit. That’s generally not the case with all composting innovations. There’s more to it than just the design. Malini and team did a good deal of legwork to understand the available solutions. But they had to travel beyond Karnataka and only in Alapuzzah did they have all their questions answered. To keep it rain-proof, all you need to do is place the FRP sheet supplied by the vendor on top of the bin. These bins can also be used for vermicomposting, if need be. Aaditi is available in 3 sizes, with or without partitions. You can get partitions made as per your requirement. Small: set of 2 for 20 homes or less. Medium: set of 2 for 20-30 homes. Large: set of 2 for 30-70 homes. If you shred the waste, then you will be able to fill the bins with almost 1.5 to 2 times more waste. Power supply needed only if you use a shredder. Water is needed to activate the dry compost-maker block. Each large-sized Aaditi is of 40”x 48” dimension. If you install three of them for a 100-home community, you will need 4 ft X 14 ft space with a one-foot gap in between. Read the instructions given on the Stonesoup compost-maker block. Prepare the accelerator by dipping the block into suggested amount of water. The block expands as it absorbs moisture. Crumble it into powder-like consistency and fill it in sacks. Keep this accelerator always moist to make sure the microbes multiply and remain alive. For better results, prepare this mix a few days before you start a new batch so that the mix is charged with microbial colonies. Assemble Aaditi as suggested in the video. Spread crushed dry leaves at the bottom and let this layer be at least 6-8 inches high. Spread a thick layer of Stonesoup accelerator. These two layers play an important role in absorbing extra moisture. Usually, kitchen waste contains high moisture and if not dealt with properly, the moisture blocks air circulation and anaerobic conditions set in. This is when you encounter bad odour issues. Next, spread a layer of kitchen waste evenly. On top of it, spread a layer of Stonesoup accelerator. Repeat the procedure. On days when you have excess waste, create more layers. Do not dump the waste in conical fashion. The top-most layer should always have the accelerator further topped with dry leaves. Once again, these two layers are important as they keep flies and other insects from accessing the food waste and also ensure good air circulation. Put the lid on the top to keep it rain-proof. Secondly, the lid also prevents the heat generated during the bacterial action from evaporating unnecessarily. Once the first bin is filled, move on to the next. In this process, shredding the waste speeds up the composting process. The mesh is fortified with an inner layer of steel mesh which has small holes to ensure proper aeration. The fortification keeps Aaditi rodent-proof. Not just the design of the composter, multiple factors can trigger odour issues. Inadequate air circulation, excess moisture, lack of accelerators, etc. To cut costs, some communities reduce the quantity of the accelerator only to witness a host of problems later on. If the process is followed properly, then odour issues do not crop up. Since Aaditi has ample circulation all around, it ensures a hassle-free composting process. But you must add sufficient quantity of suggested compost-maker blocks to ward off any remote possibilities. If harvesting cannot be done with ease, then it takes away all the joy of inhouse composting. 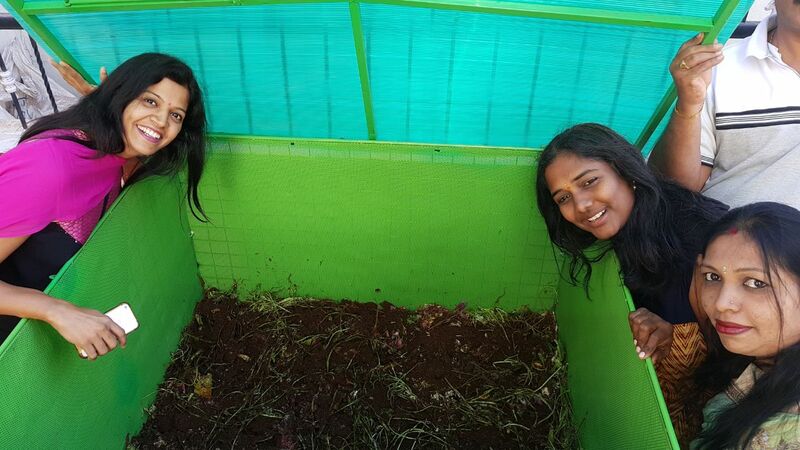 With detachable mesh walls, harvesting an Aaditi composter takes just a few minutes. Check out this gallery. When someone who knows nothing about composting uses your solution and wraps up the first experiment with some nice-smelling compost, then you have got many things right, if not all. For a 100-home community, you will need a set of three large Aaditis. Size of each bin: 1,100 litres with a footprint of approximately 40” x 48”. Number of bins needed: Three. Each bin takes in waste for 20 consecutive days and three bins would allow for a 40-day composting period. Typical cost of such a system: Rs 98,000 (Rs 32,500 per bin) giving a per-house, one-time cost of Rs 980. This does not include GST or freight or other levies. Labour needed: One person for approximately one hour of work per day. Operational cost: Apart from labour cost, the recurring cost of compost-maker blocks. One sack of six compost-maker blocks at Rs 2,500 each per Aaditi. For 100 homes, it is nine blocks at Rs 3,750 per month. Stonesoup, #37, 1st Main, 1st Block, Koramangala, Bengaluru-560034. http://www.stonesoup.in. Contact no: 9108462846. Email id: manager.aaditi@stonesoup.in. This entry was posted in Community Composting and tagged Aaditi from Stonesoup, community composter for lanes, community composting method. Bookmark the permalink.